Zucchini contains a lot of vitamins, but almost no calories. This product is often used for the prevention of obesity. However, fried this vegetable loses almost all useful properties. So zucchini it is better to boil, simmer and cook in its own juice. - Basil, black pepper, garlic - to taste. Large squash should be cut transversely into several pieces, 5-6 cm each. The pieces should remove the core, leaving the bottom to came a small Cup. Next you need to mix grated cheese, chopped mushrooms, chopped carrots, rice, Basil, pepper and garlic. That products are not wasted, the recipe can be used and taken out of the zucchini pulp, adding it to the ingredients. The resulting vegetable minced meat must pass through a meat grinder, put it in a Cup of zucchini and sprinkle them with beaten egg. The oven should be preheated to 180oC. The dish should bake in a greased with olive oil form 20-30 minutes. It is better not to peel the zucchini before cooking, as the peel of this vegetable contains many nutrients. - herbs, black pepper, salt - to taste. 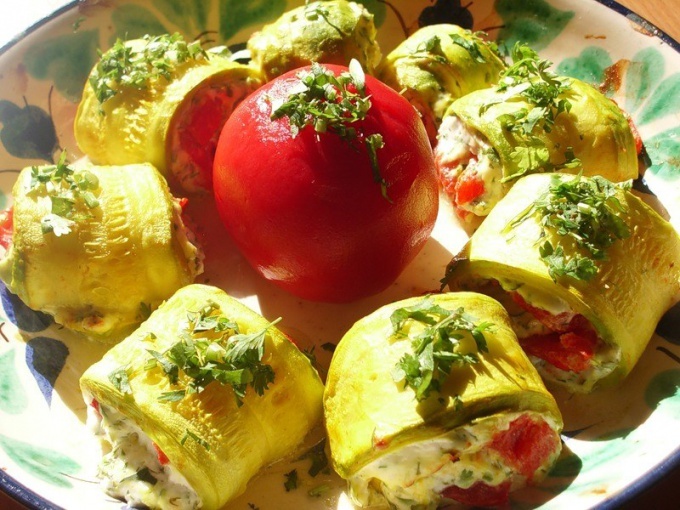 It is necessary to cut the squash in large cubes, onions, peppers, eggplant and carrots - chop. These ingredients should be put in a pot, cover them with a little water and simmer for 10 minutes. You need to choose a zucchini with dark green skin. They are best suited for special diet meals. Tomatoes should be scalded, to clean it from the peel and mince the pulp. Next is to fry the flour, dilute it with water, and then add this mixture into the tomatoes, pepper, salt and herbs. The mixture need to pour to still the prepared vegetables and bring the dish to boil. After removing from the stove squash stew needs a little brew in the pot. More spicy and interesting taste of this dish will add a clove of garlic. - garlic, salt, Basil, oregano, marjoram - to taste. Carrot, turnip, radish and turnips need coarsely grate a cabbage - chop. Zucchini should be cut into small slices and mix with the other vegetables. All the ingredients, pour water (diet soup is better to cook with vegetable broth). The resulting mixture should be cooked for 30-40 minutes. Kefir should add spices and garlic. This mass must pour the squash soup before serving.